The Starting Point: The current mercantile was built from the white block gas station shown here. The main portion of the store consists of this base. The kitchen, dining area, stairs, and upstairs were added from this foundation. 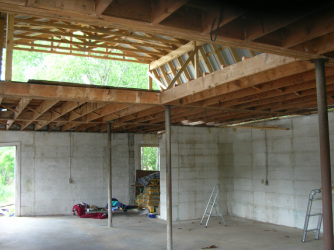 Raising the roof: The upstairs had to be added first to provide a space for the antiques and collectibles. You can see the "hole" being constructed for a special chandelier right from the start. 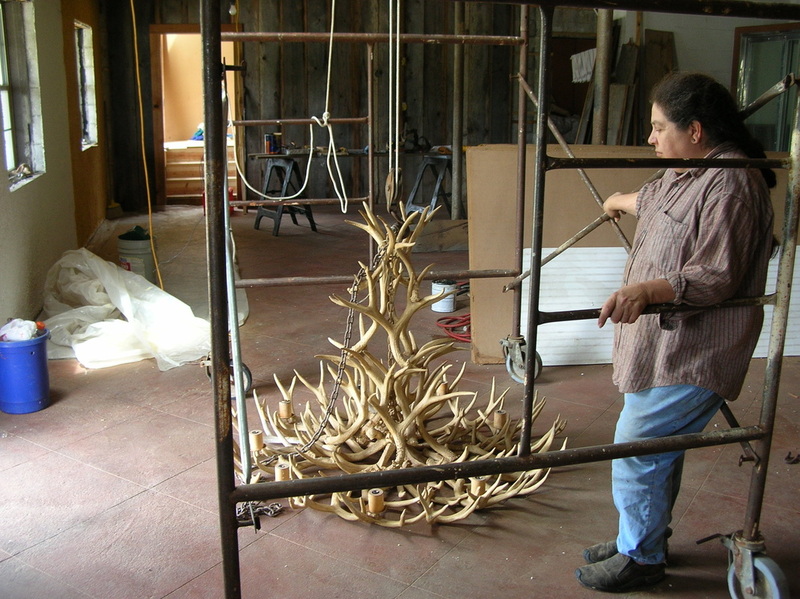 It wasn't until three years later that Rose Marie finally found the antler chandelier to fill the space of honor. The red tin roof and a porch for the rocking chairs were added next. 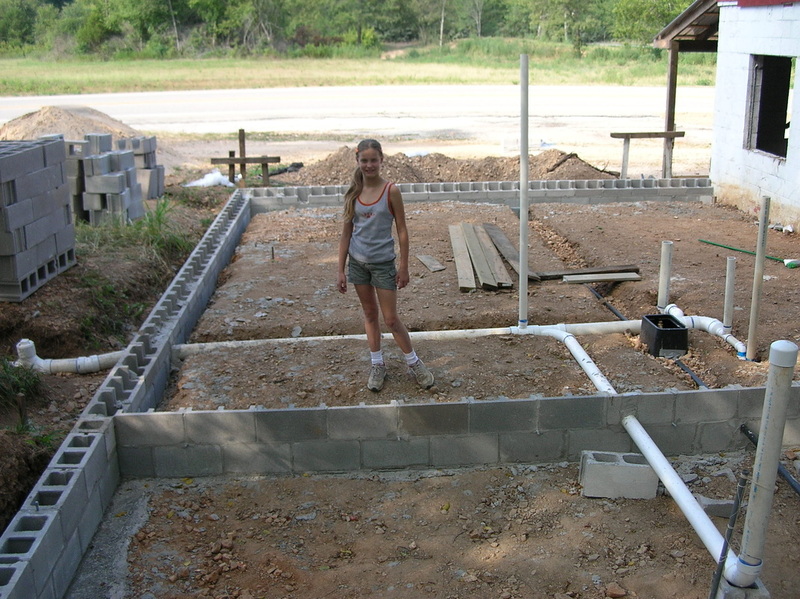 Space for a kitchen: A much younger Nikki stands on the foundation for the cooking areas. 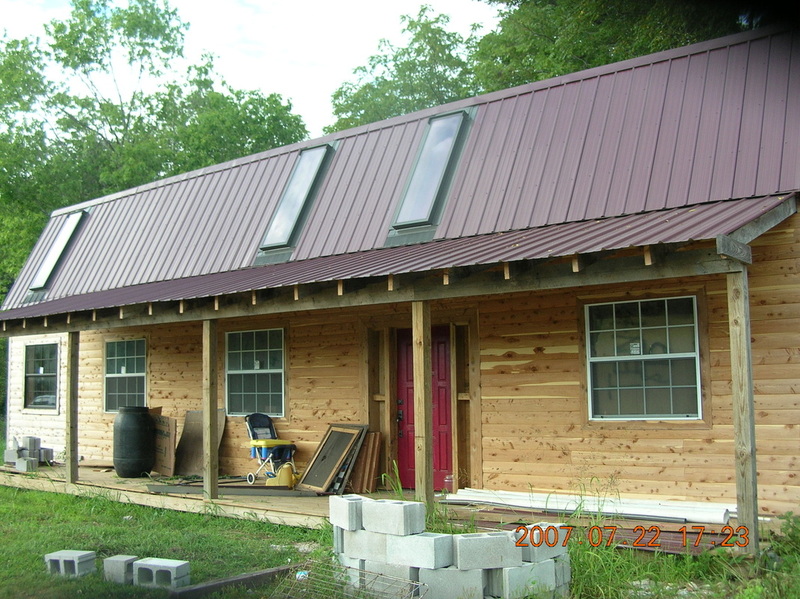 Doors, windows, and red cedar trim were in place by summer 2007. You can also see the additional area added to the original structure on the far right to accommodate the stairs. A light in the storm: Raising the chandler gave a sense of rightness to the whole project. You can also see that the floor was etched and stained and the walls were refinished by this point in time. Each piece of gray barnwood in the mercantile was taken from a barn in northern Arkansas, planed by hand, and nailed in place by Lou and Rose Marie. This is a story about a piece of land a family. It is written primarily from the perspective of Angela, the Brandt's older daughter. Some of her opinions will not doubt flavor the writing. She thought you might enjoy getting to know our past and the past of this little piece of the Ozarks on some lazy afternoon. story we'll start with, is the story of the Brandts and how their dream and this little piece of property met up. They moved to northern Arkansas because they wanted a safe, clean environment to raise my brother and I, and they didn't feel that city life fit our family. The family goat dairy started up again after the move and ran until Angela (me!) went to college. We also have/had a few cows, a few goats, a few chickens, and a few other four-legged critters. Rose Marie eventually decided to go back to college for her education requirements to become a high school science teacher. And several years later, Lou became a highschool science and math teacher. They loved teaching "their kids," but the hours and the workload was getting to be more every year, and they weren't getting any younger. So they found a new dream for their "retirement" years- The Dry Creek Homestead Mercantile. They wanted to continue contributing to the local community by having simple grocery and general products available, and they wanted to share their love for the river and outdoors with a small camping, fishing, and fun section. At the same time, Rose Marie wanted to share pieces of history and stories of the past through the antiques and collectibles upstairs, and, of course, she wanted to feed everyone some simple good food. The dream was a lot of work and planning. 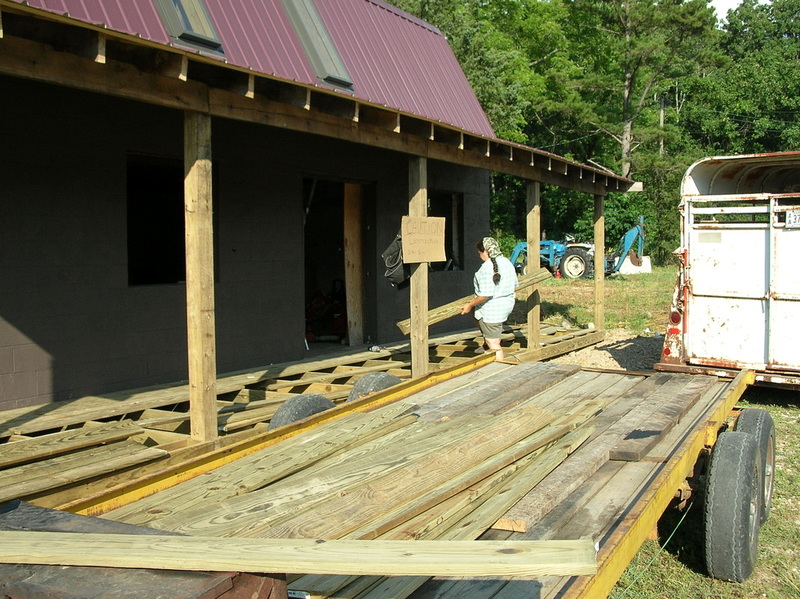 During summer, holidays and free days from teaching, they tore down an old barn, planed and stained the barn boards for the inside and outside, and dug new foundations to expand the old building. They searched auctions for the perfect lumber, lighting fixtures, and accessories and then refinished almost every piece. The store is still being slowly improved upon, being stocked more and more, and before fall the deli should be open. The Brandt's dream is becoming a reality, and we hope everyone enjoys all the love and work that went into its creation. 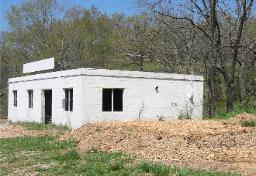 The Brandts were fortunately able to acquire the property about seven years ago and expanded the building to include an upstairs, a dining area, and a kitchen. Almost the entire structure was refinished in an old rustic style reflective of the original homestead that sat here.